We’d love your help. Let us know what’s wrong with this preview of Rune's Folly by Garen Glazier. For some the tower of shells was folly. For Tansy McCoy it was destiny. By day, Tansy McCoy is a florist making charmed bouquets for the citizens of Junonia, capital of the Kingdom of Terranmar. By night, she’s an assassin and the keeper of the Dangerous Garden where deadly blooms grow. Together with the town tailor, butcher, baker, and metalsmith (just don’t call her a can For some the tower of shells was folly. For Tansy McCoy it was destiny. Impetuous loner Tansy chafes under her Guild demands. She longs to quit her town and trade and head for the hills. Unfortunately, King Zeno has other plans. He wants to marry off his daughter to Terranmar’s famously reclusive wizard, Rune Hallows, and he's willing to have the Guild kidnap him to make it happen. Fail to deliver the wizard and the consequences will be swift and deadly. To ask other readers questions about Rune's Folly, please sign up. Really good read! I’m a fantasy lover and thoroughly enjoyed this book! If you want adventure and a book that’s hard to put down, this one is for you! 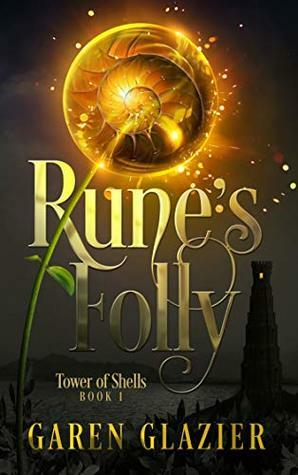 Rune’s Folly has a fresh take on fantasy and a complex back story and leaves you wondering if a sequel is in the making? I would love it! 😊 For a fun, imaginative and well written story, read this!!! I have to tell you that I really liked it. I was honestly more excited by the second half than the first because it is of course when things started happening and we got some good action going on. But then to be fair, it is the first book of the series and I think the author took a good amount of time to set things up for us. However, as I went deeper into the book it got better and I really enjoyed the characters and the overall story. I am guessing there is a book 2 coming around the corner, and I have to tell you that I really liked it. However, as I went deeper into the book it got better and I really enjoyed the characters and the overall story. I am guessing there is a book 2 coming around the corner, and I am really curious and how things will go from there. There wasn’t anything huge at the end, so, for now, I can pretty much live with how Rune’s Folly ended without too much anxiety. We all know how I do not like to wait, but waiting is easier when there is no massive cliffhanger slowly eating at me. We do get to know Rune and Tansy and I did like them, however, I believe we will see them grow more as the story unfolds. Rune’s Folly was really well written and easy to read. I finished it all in one go and truly enjoyed it. It was overly descriptive at times and we all know I am not crazy about that (personal taste) but it did not take away from the story. I do believe Garen did an amazing job with the world building and as I mentioned, I am so curious as to when book 2 is coming out. This makes for a good Fantasy series and I am hooked. I am going to highly recommend Rune’s Folly to you all, and I hope you love it as much as I did. As you can see I am not giving away too many details, but I would say that if you are in the mood for some magic and good storytelling then you will enjoy this book. Oh, wow! This book took me by surprise because I didn’t expect to love this one as much as I did. Frankly, I didn’t know I was in the mood for an adventure/fantasy until I picked this one up. I was reading this nonstop, flipping page by page, that it all suddenly ended right under my nose. And I wasn’t ready for it to end. The history and background of the world is just so in I received a free copy of this book in exchange for an honest review as part of the blog tour hosted by Xpresso Book Tours. I was reading this nonstop, flipping page by page, that it all suddenly ended right under my nose. And I wasn’t ready for it to end. The history and background of the world is just so interesting that it really pulls the readers in the story. I got so lost in Tansy and Rune’s adventures that it felt like I was there with them. Aside from the lush world-building though, the characters were one more aspect in the book that I absolutely adored. Tansy, for one, is a great main character. She’s strong-willed, sarcastic (which I always appreciate) and maintains a bravado despite her constant self-doubt and fears. Rune is another character worth mentioning. He’s a powerful wizard who has an air of mystery to him and also has a sense of humor. But as much as I loved the two of them, I would love to get to know more about their ragtag group as well. Although I am a bit skeptical about the strength of their alliance, I think they do make a great team. I received this book as a Goodreads giveaway. This started out as quite the typical fantasy tale, reminding me of Trudi Canavan and Carol Berg. I was quite intrigued with the story and where it was going. There are some great fantasy tropes that I truly enjoyed seeing, and the characters were lots of fun. The pacing was well done and the story didn't flag or lose my attention. I also enjoyed the action sequences and some of the beautiful imagery the writing conjured up in my mind. Personally I w I received this book as a Goodreads giveaway. This started out as quite the typical fantasy tale, reminding me of Trudi Canavan and Carol Berg. I was quite intrigued with the story and where it was going. There are some great fantasy tropes that I truly enjoyed seeing, and the characters were lots of fun. Personally I would have preferred if this whole book had been twice as long as I felt that there was a ton of world building and history that could have been explored way more. I was very interested in all the world and the history of everything. I really felt it would have just enhanced the great story even more. That said, still a concise and well crafted story. I loved this book! The author did an amazing job with pulling her readers into her imaginative world (with multiple dimensions) with so many details and connections and effective character development. I was drawn in immediately—wanting to learn more about all the different characters and how various plot lines related to each other. The author was able to transition seamlessly between various characters’ perspectives and story lines and past and present to provide background. I just wanted to k I loved this book! The author did an amazing job with pulling her readers into her imaginative world (with multiple dimensions) with so many details and connections and effective character development. I was drawn in immediately—wanting to learn more about all the different characters and how various plot lines related to each other. The author was able to transition seamlessly between various characters’ perspectives and story lines and past and present to provide background. I just wanted to know more and more and loved the unique characters and what they each brought to the story. Rune's Folly was so much fun to write, and I hope it will be just as much fun to read. Enjoy! I'm a lifelong resident of Seattle. I married my Russia-born-America-raised high school sweetheart, and we have a four year old and a new little one born in February. I like coffee shops, bookstores, dancing in my living room and singing in my car. The opening scene of Up always makes me cry. The Three Amigos always makes me laugh. Fashion magazines, croissants, and long, long baths are my guilty p I'm a lifelong resident of Seattle. I married my Russia-born-America-raised high school sweetheart, and we have a four year old and a new little one born in February. I like coffee shops, bookstores, dancing in my living room and singing in my car. The opening scene of Up always makes me cry. The Three Amigos always makes me laugh. Fashion magazines, croissants, and long, long baths are my guilty pleasures. They might occur separately or together. I prefer boxing classes to yoga, and I get some of my best ideas when I'm running. I loved school and spent more time than one really should getting a business degree in marketing and a master's in art history. In an ideal world I'd go to bed at 2am and wake up at 10am. I've never been an early bird, and I feel strongly that alarm clocks kill dreams. Learn more about me and read my blog, Scriven by Garen, at garenglazier.com.